In a hurry? Choose a Honey Bun and a Charm Pack in Your Favorite Fabric Combo! Log Cabin quilts are a real favorite of ours. We love how many ways you can lay out the blocks to create entirely different looks. We also enjoy the play of light and shadow that can be achieved when using dark and light colors in each block. 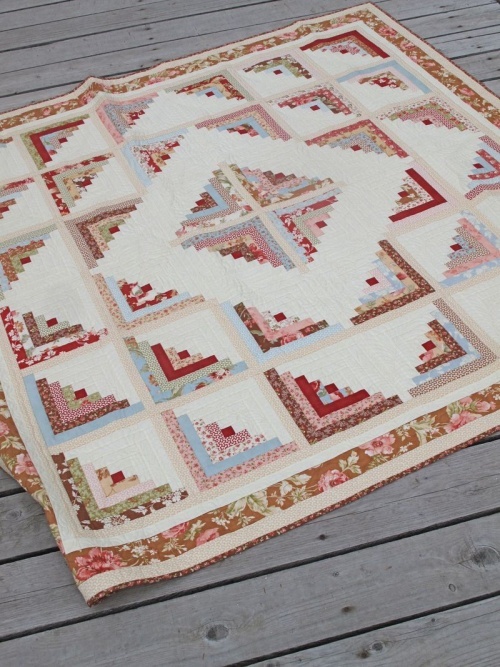 This log cabin quilt by Fig Tree Quilts has a modern look with a bit of a cozy vintage feel to it. The colors are gorgeous, but feel free to choose whatever colors you prefer and that work best with your decor. You might even make a scrappy version for a truly vintage look. Whatever fabrics you choose, your log cabin quilt is sure to be stunning! 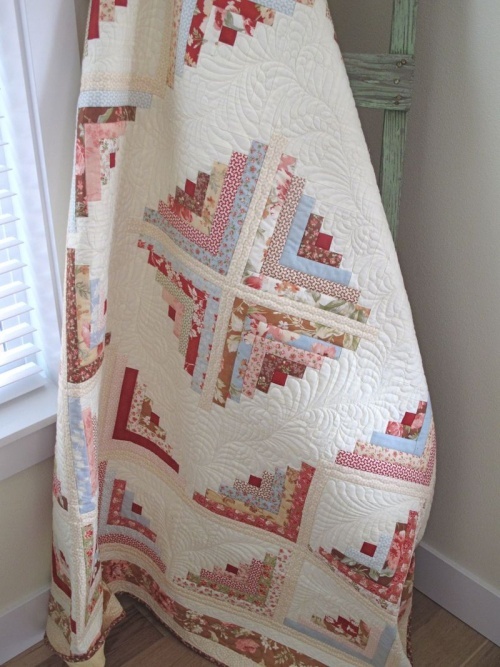 The quilting itself can be simple straight line stitch in the ditch, like in this example. Or take advantage of all that white space and make the quilting as complicated as you like, either by machine (free motion quilting) or by hand. Log cabin blocks are very easy to make. Simply sew straight strips of fabric together. There are no curves or triangles to deal with. 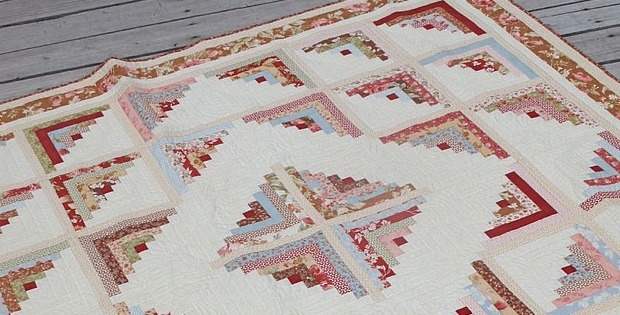 To save time on piecing this quilt, choose a Honey Bun (1.5″ wide pre-cut strips) and a Charm Pack (pre-cut 5″ squares). You’ll have little cutting to do and can focus on sewing the top together. The design is derived entirely from how you lay out the blocks. Visit this page to see several layout options for this quilt. The finished size of this quilt is 71″ x 71″. You can easily expand the size to fit a larger bed by adding wider borders. Purchase the pattern with three layout variations here.